Or better yet, don't pass that plate or saucer you might find that is a single, lonely piece. One very quick and easy idea is to glue the plate to a plaque, board, window, cupboard door, etc. Add some hooks and you have a great way to enjoy that piece. Hooks are so versatile--great for keys, towels, aprons, utensils, leashes, coats, purses, hats, etc. Here is a one I made last year--loved these saucers! And here is a dessert stand, nothing new, but again, I adored this plate and the blue candlestick. Getting those under $100 projects ready to link up Thursday? I can't wait! Love the cake stand, but then again I collect them! Adorable! I really like your idea's. Keep up the good work. Love your blog. i really need a hook at our kitchen entry and one like this would be perfect! oh becky...i'm such a plate-a-holic. i use them for all kinds of crafts. i'm with you on this post. love the projects!!! love the plates. they all are very cute, but that dessert plate is adorable! :) love the color and the pattern. soooo cute! I just have to say that I'm loving this series. I have a hard time coming up with ideas, but I can copy really well. And you are giving me a ton of stuff to copy from. So pretty! I adore the colors! I, too, very inspired! I love the plate/hook displays, and I REALLY LOVE the cake stand. Great ideas...love those blues! Very pretty. I love the blue and this is such an inspirational idea! Oh I will make note and play along in the future. Love the blue cake plate. Great ideas! Live everyone else, I love the cake stand. Wow, what a great idea! 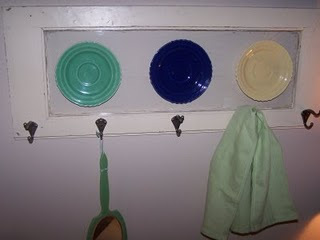 I've used plates on the wall, but I hadn't thought of mounting them! Thanks for sharing, I'm so using your idea! Too cute...love these ideas....looks like something I do. I love this idea! I have a few plates that I didn't know what to do with because they didn't have matches. Thanks! Looking forward to looking at your older posts!